Los Angeles (September 1, 2017) – Ahead of its first-ever World Cruise scheduled for this winter, Viking Cruises® (www.vikingcruises.com) today announced Viking Sun® will continue to sail the globe on the company’s second World Cruise, which will span 128-days, five continents, 21 countries and 44 ports, with 10 port overnights. 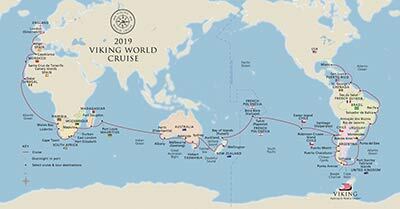 Departing on January 3, 2019 on the soon-to-be delivered fourth vessel in Viking’s award-winning ocean fleet, this grand journey will mark Viking Sun’s second voyage around the world. The ship will spend much of her maiden season on Viking’s first World Cruise, which departs from Miami on December 15, 2017. Sailing from Miami to London, the new 2019 World Cruise itinerary allows guests to explore South America and the islands of the South Pacific; call upon ports in Africa, from Cape Town to Dakar; and cruise the Strait of Magellan, Tasman Sea, and Indian Ocean, before concluding in London. As with all Viking itineraries, guests receive a complimentary shore excursion in each of the 44 ports and free unlimited Wi-Fi; World Cruise guests also receive Business Class airfare and all gratuities and service fees, along with an extensive list of added-value included features in their cruise fare. Rio de Janeiro, Brazil: Peak of Brazilian Culture—During an overnight stay in the historic city of Rio de Janeiro, guests can visit Corcovado Mountain and the iconic Christ the Redeemer statue before relaxing on the scenic Copacabana and Ipanema beaches of the coastal metropolis. Port Stanley, Falkland Islands: Islas Malvinas—This remote archipelago, also known as Islas Malvinas, is comprised of nearly 200 small islands and home to less than 4,000 people. Renowned for their maritime history, guests can learn the rich history of the Falkland Islands while visiting the capital, Port Stanley, and experience the abundant wildlife of the surrounding waters including penguins, dolphins, seals and orcas. Ushuaia, Argentina: “End of the World”—Perched on a steep hill on the southernmost tip of South America, commonly referred to as the “End of the World,” guests can explore the scenery of Ushuaia through excursions to the nearby Escondido and Fagnano Lakes, and the Tierra del Fuego National Park, which was first inhabited by humans 10,000 years ago. Easter Island, Chile—Isolated in Mystery—Resting 1,200 miles from its nearest neighbors, Easter Island is the world’s most remote inhabited island. Guests will visit the island’s famed archaeological sites, including the nearly 900 monumental Moai stone head statues, part of the UNESCO World Heritage site of Rapa Nui National Park. Milford Sound, New Zealand—Astonishing Landscape—Guests will have the opportunity to sail the breathtaking waterway of New Zealand’s Fiordland National Park in Milford Sound. Stretching for almost 10 miles, from the Tasman Sea into a wonderland of alpine peaks, the landscape features monolithic granite walls and waterfalls as tall as skyscrapers. Hobart, Tasmania—An Island of History and Wilderness—Capital of Australia’s island state of Tasmania, Hobart sits nestled amongst the foothills of Mount Wellington and at the entrance to the Derwent River, and offers guests the chance to learn about its UNESCO World Heritage sites, including historic convict locations and a unique wilderness area. Maputo, Mozambique: Wildlife Abounds—While visiting this Indian Ocean port, guests can experience the preserved Portuguese colonial architecture and local markets in this historic city, before venturing to Kruger National Park for an overnight safari and a chance to view the “Big 5:” lions, African elephants, African leopards, Cape buffalo and rhinoceros. Cape Town, South Africa: Cultural Riches—An overnight stay in Cape Town helps guests explore this city in-depth. Guests can appreciate the picturesque landscape from the monolithic wonder, Table Mountain, enjoy an afternoon of wine tasting at the Vineyards of Stellenbosch, or stay in the city to witness an array of historic architecture and delicious cuisine. All Veranda Staterooms: Guests can choose from five stateroom categories, starting from 270 sq. ft. Veranda Staterooms, all with private verandas, sweeping views of the destination and premium amenities that include king-size beds with luxury linens, generously proportioned closets, large interactive flat-screen LCD TVs with movies-on-demand, unlimited complimentary Wi-Fi and award-winning bathrooms with large showers, premium Freyja® bath products and heated floors. Prices for Viking’s World Cruise start at $49,995 per person and include Business Class air, transfers to and from the ship, all gratuities and service fees, complimentary visa service, free luggage shipping services for embarkation, and Viking’s Silver Spirits beverage package covering virtually all drinks on board. From now through September 30, 2017, each guest who books the World Cruise will also receive $2,000 in shipboard credit, which can be used toward optional tours, spa services, onboard shops and beverages. Viking Explorer Society members receive an additional $1,000 in onboard credit and added exclusive Viking Explorer Society member savings, if they book before September 30, 2017. Combined with Viking’s other inclusions, this represents a value of more than $20,000 per guest. For additional booking details, contact a travel agent or call Viking toll free at 1-855-8-VIKING (1-855-884-5464). Viking Cruises was founded by Chairman Torstein Hagen in 1997 with the purchase of four ships in Russia. Celebrating its 20th anniversary in 2017, Viking is the leader in river and small ship ocean cruising, offering destination-focused itineraries designed for experienced travelers who have an interest in geography, culture and history. In its first two years of operation, Viking has been rated the #1 ocean cruise line in Travel + Leisure’s 2016 and 2017 “World’s Best” Awards. Viking currently operates a fleet of 62 vessels, offering scenic cruising on rivers and oceans around the world. By 2022 the company will operate eight 930-guest ocean cruise ships and will be the largest small ship ocean cruise line. In addition to the Travel + Leisure honors, Viking has also been honored multiple times on Condé Nast Traveler’s “Gold List” as well as recognized by Cruise Critic as “Best Overall” Small-Mid size ship in the 2017 Cruisers’ Choice Awards, “Best River Cruise Line” and “Best River Itineraries,” with the entire Viking Longships® fleet being named “Best New River Ships” in the website’s Editors’ Picks Awards. For additional information, contact Viking Cruises at 1-855-8-VIKING (1-855-884-5464) or visit www.vikingcruises.com . Page Viking Announces Second World Cruise for Fourth Ship Ahead of its first-ever World Cruise scheduled for this winter, Viking Cruises® (www.vikingcruises.com) today announced Viking Sun® will continue to sail the globe on the company’s second World Cruise, which will span 128-days, five continents, 21 countries and 44 ports, with 10 port overnights.